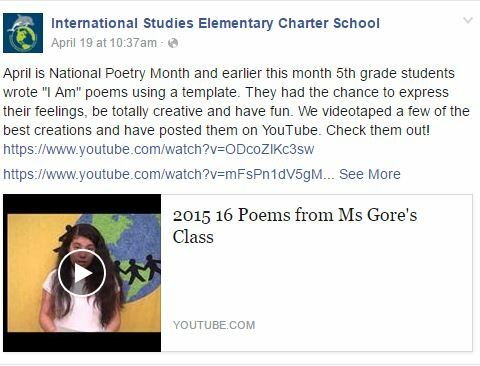 Earlier this month I celebrated National Poetry Month with fifth grade students. 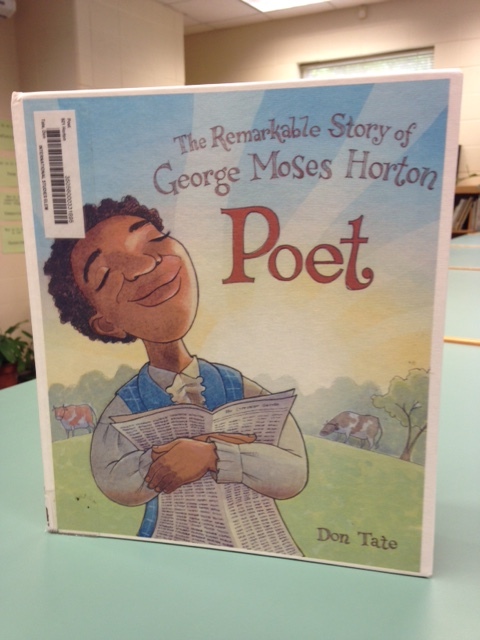 At the first library visit I read the picture book biography, Poet: The Remarkable Story of George Moses Horton written and illustrated by Dan Tate (Peachtree Publishers, 2015). This is a moving story about a slave who teaches himself to read and goes on to write poetry, publishing several books in his lifetime. This is a good book to read to these students as they study the U.S. Civil War and are very familiar with the concepts. We discuss how his poetry expressed his feelings about himself and his life. I found a template on the Freeology site (http://freeology.com/graphicorgs/i-am-poem-template/). I gave copies of the template to the teachers and instructed the students to express themselves as George Moses Horton did in his poetry. The teachers had their students complete their poems during morning work time or other convenient slot. Some of the students put a lot of effort and thought into writing their poems. I chose the best works and asked the students if they wanted me to video them reading them. Only 2 students out of about 20 declined. Working around teachers’ schedules (they were all prepping their students for the upcoming Georgia Milestones, our state tests), I managed to record each class with a Flip camera. I still love these little cameras. So convenient and easy to use. I put the videos together using Windows Movie Maker. Now, ideally, if it weren’t the week before testing, I would have had the students put the movies together. However, I knew they didn’t have the time to take away from instructional time. I usually like to give them hands-on experience with this type of technology, even if it’s only a few students and not the entire class. After completing the movies, I uploaded them to my YouTube channel and emailed each teacher the link to their class’s video. Then I did a post on our school’s Facebook page to let parents and community members see our students’ work. Poetry writing continued in the library all week! I chose different poetry writing activities for each grade level, geared toward their development level. 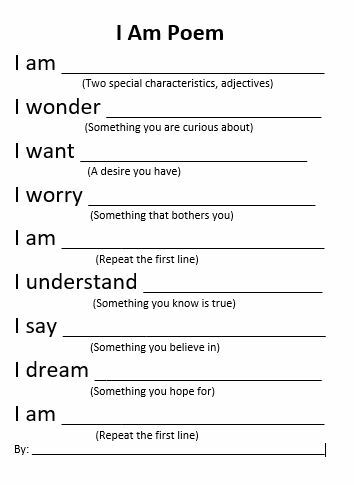 I found a template for an “I Am” poem on the Freeology website, but decided it was too long for first graders (and we only had about 20 minutes to complete the activity) so I adapted it. After discussing what the students knew about poetry and reading a few poems, they started writing. I wanted to videotape the students reading their poems, but I decided that I would not have the time to do it with the 80+ students in all 4 first grade classes. I chose the most successful poem; ones that were the most original and showed some careful thought. April is an interesting month at our school. We return from spring break and two weeks later we give state standardized tests. But poetry seems to be a good thing to cover; it’s fun, creative and no pressure! 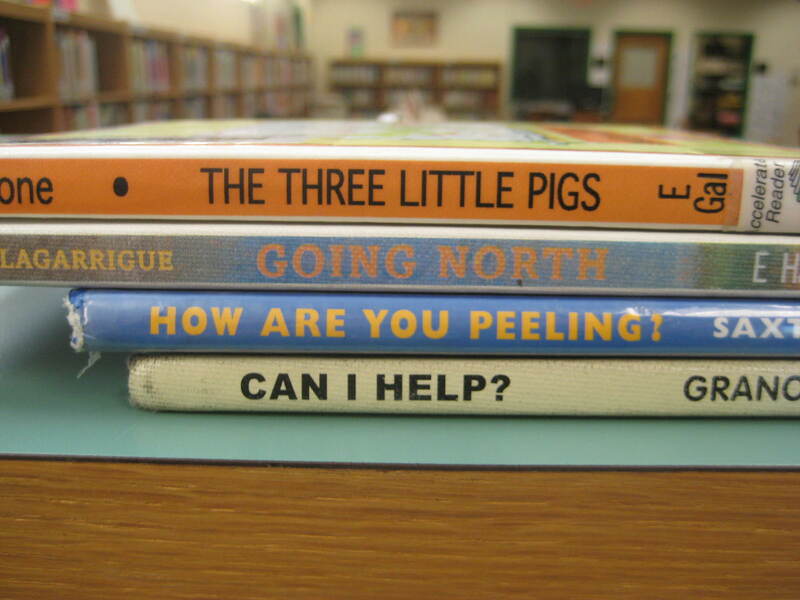 Today I worked with a fourth grade class and they made spine poems. I start by asking them what they knew about poetry using IB (International Baccalaureate) key concept questions (what is it-form, why do people write it-perspective, what is the function. etc.). 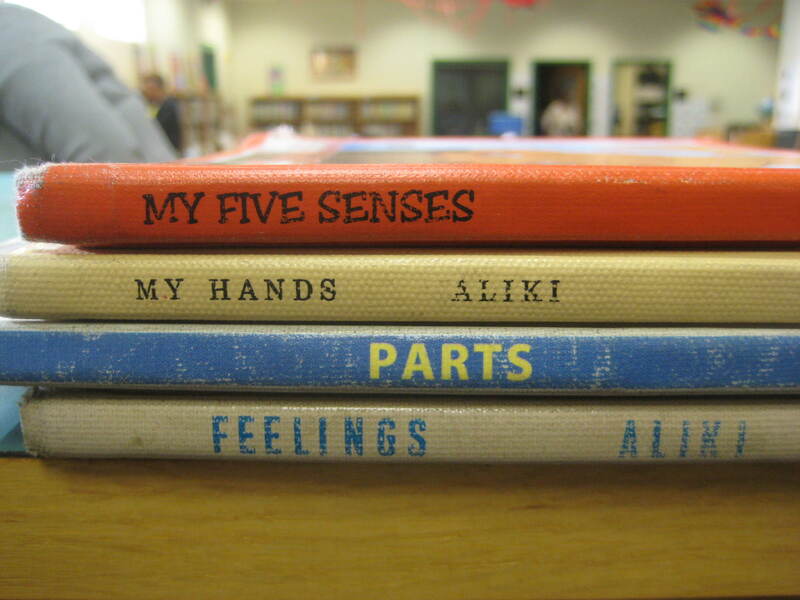 We discuss what found poetry is and let them know that spine poetry is a type of that poetic form. I assign them a section of picture book shelves (to limit too much traveling around the library) and limit them to 6 books or so (to decrease the mess of incorrect reshelving). They really have a good time! They work in groups of four or so students and most need very little help. Here are three of the best. 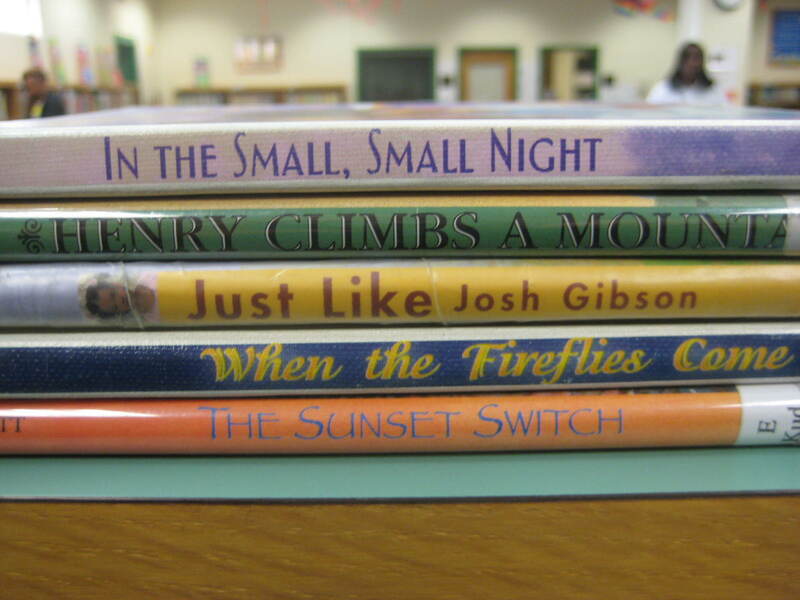 Spine poems composed by 4th grade students.